Missouri remained largely unexplored until the late 1600s when Frenchmen Jacques Marquette and Louis Jolliet ventured along the Mississippi River in 1673. As the Mississippi and Missouri rivers became major channels for trade, the French began establishing permanent settlements in the region. Missouri was absorbed by the Company of the West in 1719 and became part of the Illinois Territory. Modern day Missouri was still chiefly uninhabited by the mid-1700s. Small settlements at Kaskaski, Fort de Chartres and Ste. Genevieve were created, but overall the population remained small. The few who lived in the area were mainly wheat, corn, and tobacco farmers. After the Seven Years’ War, French control of the territory passed into Spanish hands. St. Louis, today one of Missouri’s largest and most well known cities, was established by Gilbert Antoine de St. Maxent and Pierre Laclède in 1764 just before the French gave up power in Missouri. After the colonies won independence from Britain, Missouri witnessed a large influx of American immigrants. 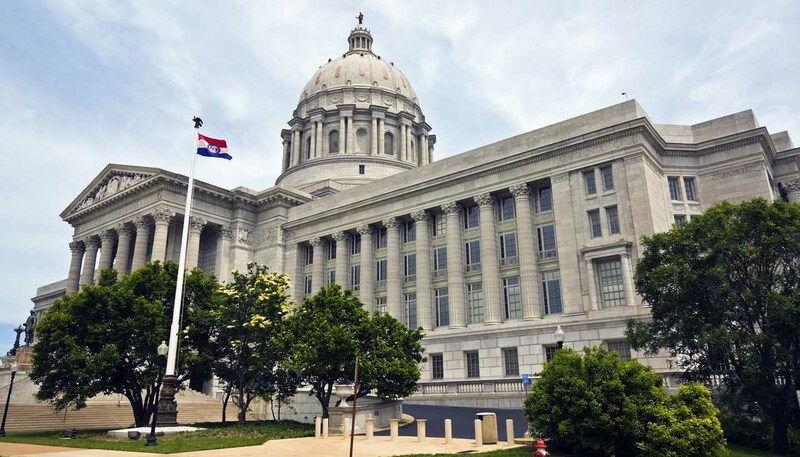 Initially opposed to the idea, the Spanish began advertising for cheap land and low taxes in Missouri to encourage American settlers when the Spanish went to war with England in 1796. France regained control of Missouri in 1800, and the land was sold in the Louisiana Purchase to the US in 1803. The Missouri Territory was created in 1812 and in 1821 Missouri became the 24th state in the Union. In the years leading up to statehood, Missouri saw a rapid influx of settlers that drastically improved the local economy. Missouri sided with the Union in the Civil War, and was a strategic state in the battle between north and south. Many battles took place in the state among Union forces and rebel Missourians who, against the state’s demands, sided with the Confederacy. After the Civil War, Missouri became an important trading centre; expansion of the railroads from the west increased the population and trade, and trading and merchants travelled along the nearby Mississippi and Missouri rivers, making St. Louis and economic hotspot of the era. In the early 20th century, the Missouri economy took off; manufacturing, agriculture, and mining were all integral parts of the state’s industry. The Great Depression hit Missouri hard, manufacturing fell, sales decreased, and unemployment rose drastically. During WWII, many of these economic troubles eased, with much of the population moved from rural areas to urban for work. Agriculture and manufacturing both picked up and restored the state to its pre-Depression industrial achievement. Missouri is an overwhelmingly Protestant region, with Baptist being the largest denomination by far. Methodist and Presbyterian are also large Protestant groups. The state has a fairly large Catholic population, along with smaller groups of Jewish, Eastern, and Muslim populations. Famed author Mark Twain is a Missouri native. His world renown novels, The Adventures of Tom Sawyer and The Adventures of Huckleberry Finn are set in Hannibal, Missouri. Today, enthusiasts of Twain’s works can visit the city, where many attractions are based on the two novels. The Major League Baseball team, the St. Louis Cardinals, has a cult following in the state, but more specifically in the St. Louis area. The majority of residents are die-hard fans and will defend the baseball team fervently against any rival fans. English is the official and most widely used language in Missouri. A small population of Spanish speaking residents also resides in the state, mostly centred around the urban areas. Smaller groups of German, French and Chinese speaking residents also live in the state, among many other language groups.